The main aim of this article is to give a recap of the debate between Bill Nye and Ken Ham for those who have not seen it or who were unwilling to sit through the three hour ordeal. At the end, I will give a few comments of my own for those who are interested. If you go to the Youtube channel to watch the much-ballyhooed debate about evolution and Bible teachings, you will notice that it ramps up with a pretty classy countdown featuring, on the one hand, a picture of Bill Nye, the proverbial Science Guy, and on the other a picture of Ken Ham, CEO of something called Answers in Genesis. After the countdown, there is a very cheesy advertisement for the Creation Museum–Ham’s home court and the locale of the debate–featuring a cartoonized safari-hat-clad Ken Ham and offering free admission to children under 12 when accompanied by a paying adult. When the debate begins, you get the slight feeling that this is not a debate in the sense that each debater had to prepare on his own. There is something rehearsed or scripted about it, from the moderator Tom Forman’s toothless jokes (“This is a very old debate, ‘Where did we come from?’ My answer is from Washington this morning by airplane”) to the slide presentations that seem to answer one another. We are told that there was a coin toss to determine who would go first, which Ham, the man behind the Creation museum, had won. Ham’s argument, which we will hear repeated over and over, is well rehearsed and philosophical in nature. Rather than relying on empirical evidence, the arguments rely on drawing distinctions and creating definitions. The main distinction he attempts to put forth is that there is a difference between “observational” science and “historical” science. Observational science, Ham argues, is the same empirical science for everyone, and is what gives rise to technology. But, historical science, which is science about origins and history, is separate. This science is necessarily dogmatic, with secularists holding their views and creationists holding theirs, presumably because one cannot observe the past in the sense that one can observe the present. The secular media has conflated the two types of science and has attempted to label creationists as unscientific. A lot of Ham’s support is anecdotal, and he gives examples of more or less obscure scientists who also happen to be creationists, featuring brief blurbs from them on his slide deck. The most notable one he brings to bear is Raymond Damadian, to whom he attributes the invention of the MRI. While it cannot be denied that Damadian was a scientist and inventor, it should be noted that his creation of the MRI is at least contested. In 2003 the Nobel prize for developing MRI technology was given to Paul Lauterbur and Sir Peter Mansfield. At the same time, I think that Ham’s point is well taken: one can be an excellent scientist or engineer and also believe in creation. Ham is also not shy about stating his moral beliefs that come from his Christian interpretation. At one point, Ham presents an illustrative diagram that displays laybeled bricks placed upon one another. On the one hand is a foundation of God’s word, upon which are placed the stones of moral absolutes, marriage (between a man and a woman), sanctity of life, and life begins at fertilization. On the other hand, upon the rock of Man’s ideas/naturalism is built: moral relativism, marriage??? [sic], euthanasia, and abortion. If you look closely, Ham seems to get choked up at the conclusion of his initial argument, at around the 57:45 mark, when speaking of the fact that children should be taught of the loving creator God. Ham does convey himself as being likable, earnest, and presenting something that is at least plausible. Nye begins by giving us a little bit of humorous insight about himself. He began wearing bow ties in elementary school. Yes, he was that guy. He wore the bow tie before it was cool, long before the hipsters appropriated it, and he will be wearing it after. Nye’s argument is typically scientific, and begins by taking aim at the “young earth” hypothesis. Kentucky, where the debate is held, is atop layers of limestone that are full of fossils, fossils that lived full lives. If you do the math, 6000 years is not enough time to account for them. When one looks at geological layers, simplistic life forms are on the bottom layers, and more complex life forms are in the upper layers, and this is the general rule. Nye challenges the audience to find an instance of an advanced species preserved in a lower layer. Ice drillings in the arctic can have over 680,000 layers, each layer of snow-ice corresponding to one winter/summer cycle. Nye seems inherently aware of the fact that when it comes to scientific reasoning, one may have countless examples of nature acting in accord with a theory, but it only takes one counter-example to disprove it. A theory’s ability–not only to explain–but to predict is important. Nye then takes aim at the myth of the flood. Ham has historically claimed that the Grand Canyon was formed by the flood, but if so, one would expect Grand Canyons on all of the continents. He points out the implausibility of a family of eight being able to construct a wooden craft of the proportions of the ark and being able to sustain the life of all of the species of land animal on board. There is also the difficulty of the survival of plant species. There are trees that are far older than 4000 years old. Few to none of the land plant species would have survived being submerged for a year in the flood. At this point, Nye makes one of his best arguments, and one can see Ham’s visible discomfort at this point in the lecture. The ark supposedly landed on Mt. Ararat in the middle east, in what is present day Turkey. If so, one would expect the animals to disembark from the ark and to spread out throughout the world. But, if this were the case, one would expect to find, say, kangaroo fossils in the middle east. But, kangaroo fossils are only to be found in Australia. Secondly, Nye smashes Ham’s distinction between observational and historical science. He points out that, on account of the speed of light, every time we open our eyes we are looking into the past, and all that astronomy can do is to look into the past. In fact, there are billions of stars that are more than six thousand light years away. Finally, we have Nye’s third knockout blow. Ham has claimed that the Noah narrative is plausible because not every species had to be on board the ark, just every “kind,” which is a smaller number, a number, as Ham would have it, that is closer to 7000. After they disembark the ark, the animals create the different species of their kinds. Nye points out that, in rough estimation, there are about 16 million species in existence today. If these were to come from an original 7000 species, then one would expect eleven new species to arise every single day, somerthing we simply do not see. To be fair to Ham, he does make a strong argument that is not answered by Nye, but it is again more philosophical in nature. In the absence of an intelligent creator, how are the laws of logic and the uniformity of nature to be explained? But, it should be emphasized that these support the idea of a more philosophical God than the God of Genesis. After all, Nye has already pointed out that one would have to violate the law of the uniformity of nature in order to support a creationist perspective. For us in the scientific community, I remind you that when we find an idea that is not tenable, that doesn’t work, that doesn’t fly, doesn’t hold water, whatever idiom you’d like to embrace, we throw it away. We are delighted! … Your view that we are supposed to take your word for this book, written centuries ago, translated into American English, is somehow more important than what I can see with my own eyes is an extraordinary claim. At this point, he picks up a fossil embedded in a rock that he had brought with him, and shows it to the audience. There has been much talk in the media about whether or not it is a good idea for scientists to even debate creationists and that it might be better to simply ignore them, because to acknowledge them is to legitimize them. Some such voices have been attributed to the Richard Dawkins camp. The philosopher in me considers these arguments to be pure silliness. Dawkins has practically made a living taking apart creationism in writing, why place an arbitrary prohibition on verbal argumentation. But, more to the point is that to call any set of ideas anathema is a step away from true liberal education and toward dogmatism. I was educated at Jesuit universities. There is no lack of religion there, nor is there a lack of excellent scientists and philosophers. 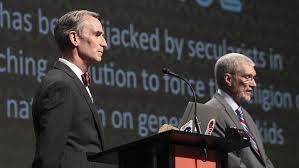 Over-all, I believe that Bill Nye won the debate, as he should have. To use modern science to debate biblical beliefs about origins is something like using a chainsaw to slice bread. Nye is to be credited for championing the scientific side in a civilized, respectful, and curteous way. Both Nye and Ham came off as being courageous orators, willing to stand up for their beliefs, while acknowledging that not everyone agrees. Over-all the debate was thought provoking and a joy to watch. Even Dawkins himself might learn a thing or two from watching it.